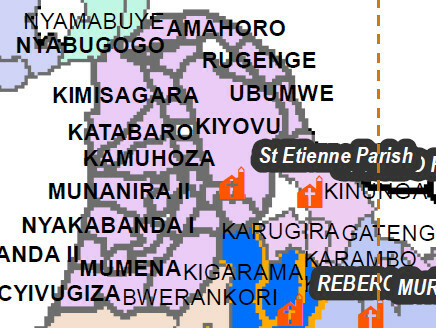 St. Etienne Cathedral borders with Gikondo Parish to the east, Nyarufunzo Parish to the north. To the west there is Ruyenzi Parish which is found in the Shyongwe Diocese. There is also Kanyinya and Gatsata parishes of Kigali archdeaconry, that are also found to the north. It also borders with Kacyiru Parish to the east which is found in the Gasabo Diocese. St. Etienne Cathedral operates with in 8 sectors; that of Nyarugenge, Gitega, Muhima, Kimisagara, Rwezamenyo, Nyakabanda, Nyamirambo and Kigali. All of these sectors are found in Nyarugenge District. The building of St Etienne Cathedral started in the year 1968. It was led by the first pastor called Rev. Can. Eustache Kajuga. St. Etienne Cathedral was opened on 1/11/1970. From there up to now, St. Etienne Cathedral has extended to start 3 parishes that includes; Gikondo, Kacyiru and Nyarufunzo parish (Mission parish). Now it is a parish with one local church that runs with over 1200 christians.